Everyone has those jeans. The ones that sit in the top of your closet. Whatever you call them, they are probably in your closet collecting dust and holding onto a piece of your soul. You have goals to fit into them, and you refuse to give them away. You refuse to say goodbye. You will fit in those jeans again…one day. 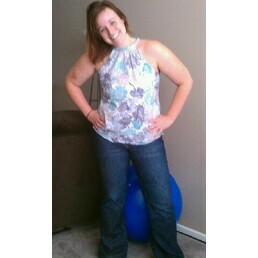 I am proud to say, I fit into those jeans today. The jeans I bought a year ago that were 2 sizes too small. And I wore them today. I bought these jeans nearly a year ago – following one of the oldest tricks in the book for weight loss motivation…I bought them two sizes too small. Side note: Only buy pants in a smaller size, I would NEVER encourage buying your wedding dress two sizes too small. I even bought mine two sizes too big and it still didn’t fit two weeks before the wedding, but that is definitely another story (and obviously I wrote about it; you can read about that here). Anyway, I could barely pull those jeans up my thighs. I definitely couldn’t button them. All three ingredients for motivation. This morning when I was getting ready, I looked up in my closet. I saw them and felt them staring at me with their buttoned eyes. Maybe, I thought. Just maybe I can fit into them. I reached for them and decided to go for it. If nothing else, it would be another dose of motivation. And to be honest, it was. And buttoned at the waist. They fit like a glove, with a little room to spare. So if you are looking for some motivation tonight, try those jeans on in your closet. I promise if you work hard enough, they will fit again. And if they end up fitting, by golly you are going down the right path my friend.